The northern part of Cheltenham, looking east. At bottom right is the Prince of Wales rugby stadium, with the leisure centre, Pittville Park and its lakes beyond. Other green spaces are also visible, including the distinctive circular recreation ground in Clyde Crescent towards top right. Slightly nearer, the Whaddon Road football ground is surprisingly less prominent. Near centre right the brownish area is the building site for the new Dunalley School. Almost at the centre of the picture, the tennis courts of Pittville School show up as a different shade of green. Left of that on Albert Road, the complex of pale-coloured buildings is the Art College. The Evesham Road runs right to left near the middle of the picture, and beyond it at the left side of the picture is the edge of the racecourse. Prestbury at upper left lies under the fields on the slopes surrounding Cleeve Hill. The northern part of Cheltenham, looking east. 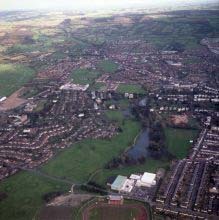 At bottom centre is the Prince of Wales rugby stadium, with the leisure centre, Pittville Park and its lakes beyond. Other green spaces are also visible, including the distinctive circular recreation ground in Clyde Crescent towards upper right. Slightly nearer, the Whaddon Road football ground is surprisingly less prominent. Near centre right the brownish area is the building site for the new Dunalley School. Almost at the centre of the picture, the tennis courts of Pittville School show up as a different shade of green. Left of that on Albert Road, the complex of pale-coloured buildings is the Art College. The Evesham Road runs right to left near the middle of the picture, and beyond it at the left side of the picture is the edge of the racecourse. 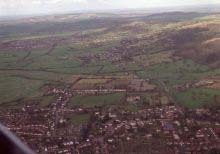 Prestbury at upper left lies under the fields on the slopes surrounding Cleeve Hill. 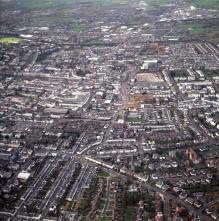 The northern part of Cheltenham, looking slighty north of east. Bottom centre is the St Pauls area, with the building site of the new St Pauls medical centre in the bottom right corner. 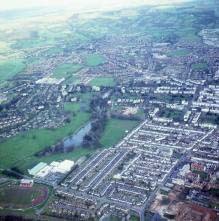 Bottom left is the Prince of Wales rugby stadium, with the leisure centre, Pittville Park and lakes beyond. Northern central Cheltenham looking east. The large pale-roofed building left of bottom centre is the postal sorting office. High Street runs diagonally from bottom centre to right centre, exiting near the distinctive spire of St Mary's Parish Church. Close to the centre of the picture is the tall white brewery office (since demolished) with the North Place and Portland Street car parks beyond it. 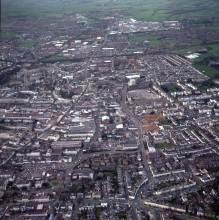 Left of the centre are Clarence Square and Wellington Square. At lower left is St Pauls with the new medical centre under construction. Just right of top centre is the GCHQ Oakley complex (now mostly demolished and replaced by a supermarket). Northern central Cheltenham looking north-east. The High Street runs across from near the bottom of the left side to the middle of the right side; St Mary's Parish Church can be seen adjacent to it near the middle. Towards lower right is the back of Royal Crescent, and the back of the municipal offices. Just below left of centre is the tall white brewery office (since demolished) adjacent to the North Place and Portland Street car parks. Almost in the centre of the picture is the brownish area of development on the corner of Winchcombe Street and Fairview Road. Just right of top centre is the GCHQ Oakley complex (now mostly demolished and replaced by a supermarket). Northern central Cheltenham looking north of west. The High Street runs in from the lower left side, becomes the Tewkesbury Road and goes out towards top centre. At the centre of the left edge is the municipal office block, with Royal Crescent behind. The dark greenish line running across about 3/4 way up the picture is the old Honeybourne railway line, now a cycle-track and footpath. Beyond it a similar feature marks the working railway line leaving the town to the north. Beyond the railway and to the right of the Tewkesbury Road is a large cluster of retail and industrial units. Just below and right of centre, the brownish area is the development site on the corner of Winchcombe Street and Fairview Road. Running across near the bottom of the picture is Hewlett Road. Northern central Cheltenham looking west. The High Street runs in from the lower left side, becomes the Tewkesbury Road and goes out towards top right. Near the centre of the left edge is the Regent Arcade with its arched roof looking rather like an enormous brown log with a white end laid on top of the building. About 3/4 way up the left edge is the bright green area of the Cheltenham Ladies College sports centre. Immediately beyond that, the dark greenish line running across the picture is the old Honeybourne railway line, now a cycle-track and footpath. Beyond it a similar feature, converging with it to the left, marks the working railway line leaving the town to the north. In the top right corner is a large cluster of retail and industrial units. 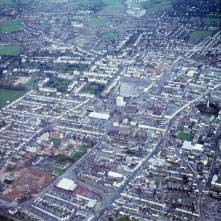 Just right of centre, the brownish area is the development site on the corner of Winchcombe Street and Fairview Road. Beyond that the Portland Street and North Place car parks are visible. Running in from the bottom right corner of the picture is Hewlett Road. North Cheltenham looking north-west. Prestbury Road runs across just below the middle. Near the left edge, just below centre is Pittville Circus. 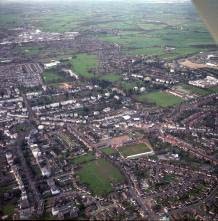 Whaddon Road football ground is in the centre right foreground. Pittville Park spreads across above the centre towards the leisure centre beyond the lake. Right of centre is the PIttville Pump Room, with 4 white buildings on both sides, on East and West Approach Drive. To the right of that is Pittville School with its pale green tennis courts, and the art college further right. 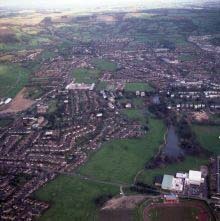 Prestbury in the foreground, with Southam beyond and Bishops Cleeve in the left middle distance. Beyond that, near the horizon is Bredon Hill. The edge of the racecourse is visible on the left edge. The ground slopes up to Cleeve Hill at the right. 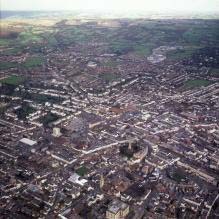 Southam centre right, Bishops Cleeve beyond. Centre left, edge of the racecourse. On the horizon, the Malvern Hills. Cleeve Hill and Cleeve Common. The port wing strut intrudes into the bottom left corner. Looking over Cleeve Common towards Winchcombe. Cleeve Hill aerial masts in right foreground. 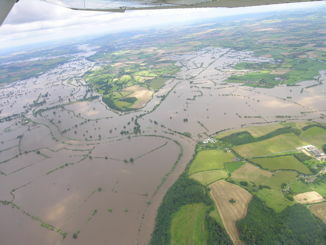 Gloucestershire floods 2007. 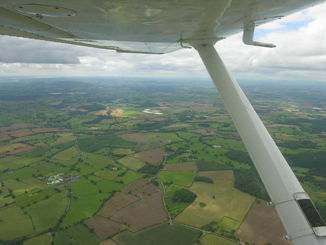 This was a solo flight after my licence revalidation. I had not specially planned to take pictures, but had a little digital camera with me as usual, so these are one-handed blind snaps of the extensive flooding in the local area. All the while I was keeping a keen lookout for other traffic as there was still helicopter rescue work going on. Climbing out from Staverton (Gloucestershire International Airport) over Down Hatherley, looking out to starboard (northwest) with the floods in the middle distance and the Malvern Hills on the horizon. 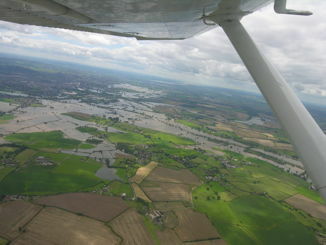 Gloucestershire floods 2007. 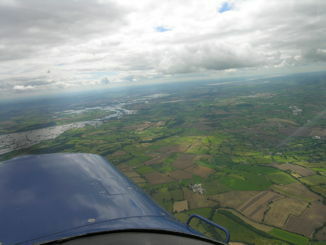 Climbing out, looking out to port (southwest) over Down Hatherley and Twigworth. 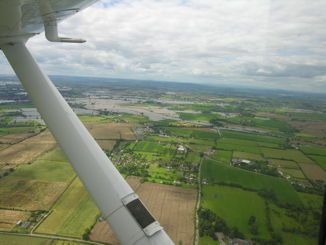 The A38, coming into the picture at lower right, goes under water just before it disappears behind the wing strut near the edge of Gloucester. May Hill is just visible near the centre of the picture. 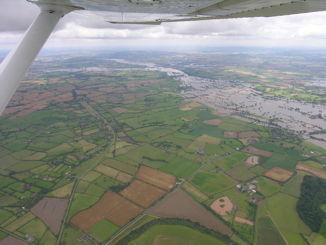 Gloucestershire floods 2007. 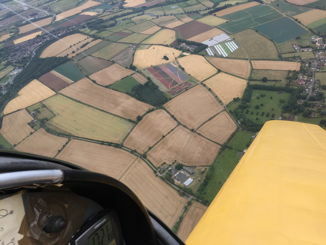 Climbing out, looking out to starboard (north) towards Bredon Hill (behind the wing strut). Norton at left side of picture, with the A38 past it going under water towards the centre of the picture. Gloucestershire floods 2007. 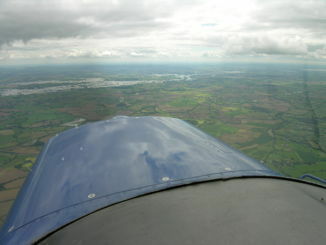 Climbing out, looking out to port (southwest) over Twigworth. The A38 is just hidden by the wing strut. May Hill is visible on the horizon just right of centre. 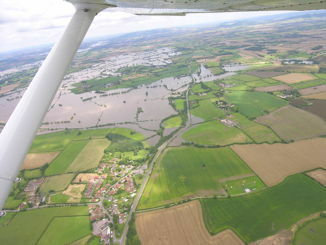 Gloucestershire floods 2007. Looking out to starboard (north) towards Bredon Hill on the centre horizon. The A38 comes in past Norton at the bottom of the picture and goes up towards Coombe Hill. The Leigh has become a peninsula with stretches of water on both sides. On the far side of The Leigh, a straight line of trees in the water marks the course of the disused Coombe Hill Canal. Gloucestershire floods 2007. Looking out to port (southwest) over Twigworth, with the A38 coming in at centre left towards Gloucester (upper left). 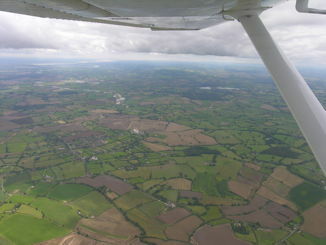 The Severn estuary is visible on the horizon near top centre. 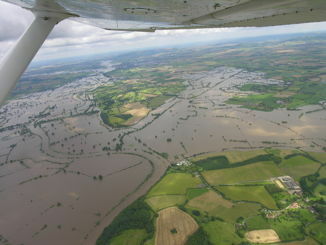 Gloucestershire floods 2007. Looking out to starboard (northwest) over Wainlode Hill (lower left). Just beyond Wainlode, the S-curve of the Severn can be seen only as the vegetation along the banks. Coming in from the right side to join the river is a line of trees in the water marking the course of the disused Coombe Hill Canal. Another line of trees all the way across the flooded Severn marks the B4213 road across Haw Bridge. The Malvern Hills are on the horizon at left. 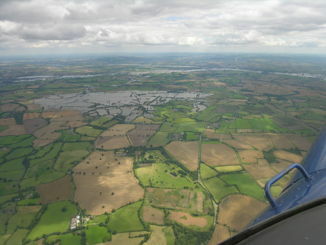 Gloucestershire floods 2007. Looking out to starboard (north) over Wainlode Hill (lower left) towards Bredon Hill (upper centre). A line of trees in the water marks the course of the disused Coombe Hill Canal, from the Severn at lower left to Coombe Hill near centre right. The confluence of the Severn and the Avon can be seen in the distance. 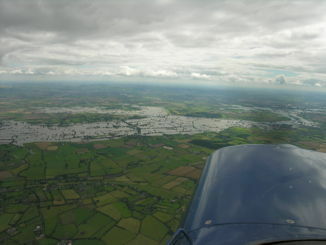 Gloucestershire floods 2007. Looking out to port (southwest) over Twigworth and Sandhurst, along the western edge of Gloucester (upper left) with the Severn estuary visible on the horizon. 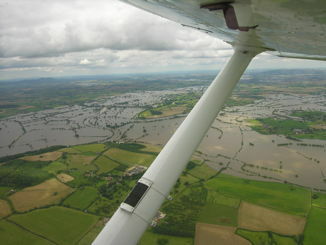 Gloucestershire floods 2007. Looking out to port (southwest) over Sandhurst, towards the western edge of Gloucester (upper left) with the Severn estuary in the distance. Gloucestershire floods 2007. Looking out to starboard (north) above Wainlode Hill (lower centre) towards Bredon Hill (upper centre). The sinuous course of the Severn is visible only by the lines of vegetation along its banks. The diagonal line of trees in the water across the centre of the picture marks the course of the disused Coombe Hill Canal, from the Severn at lower left to Coombe Hill upper right. Another line of trees across the flooded area at the left marks the B4213 road across Haw Bridge. In the distance is the confluence of the Severn and the Avon. 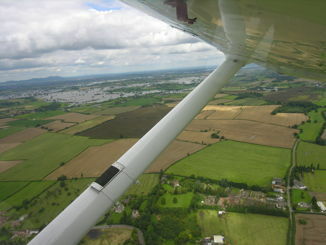 Gloucestershire floods 2007. Looking out to starboard (north) above Wainlode Hill (lower right) towards Bredon Hill (near upper centre). The sinuous course of the Severn is visible only by the lines of vegetation along its banks. The diagonal line of trees in the water across the centre of the picture marks the course of the disused Coombe Hill Canal, from the Severn at lower left to Coombe Hill upper right. Another line of trees across the flooded area at the left marks the B4213 road across Haw Bridge. In the distance is the confluence of the Severn and the Avon. 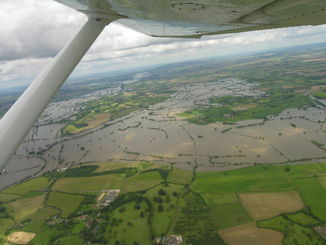 Gloucestershire floods 2007. Looking out to starboard (north) above Tirley towards Bredon Hill (near horizon centre). Curving lines of vegetation along the banks show the course of the Severn. To the right of Tirley is Haw Bridge, marked by the line of trees across the flood. In the middle distance is the confluence of the Severn and the Avon. 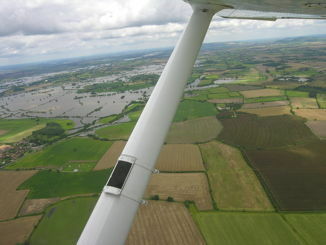 Gloucestershire floods 2007. Looking out to port (southwest) over Ashleworth and Hartpury, towards the western edge of Gloucester (upper left) with the Severn estuary in the distance. The big bend in the Severn around Arlingham is prominent. The River Leadon comes across the centre of the picture to join the Severn. The course of the Severn is marked by the trees along its banks at centre left. Gloucestershire floods 2007. Looking out to starboard (north) above Corse Lawn and Chaceley towards Bredon Hill (horizon centre). In the middle distance is the confluence of the Severn and the Avon at Tewkwesbury. 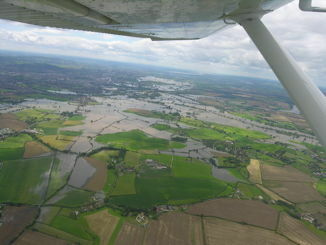 Gloucestershire floods 2007. 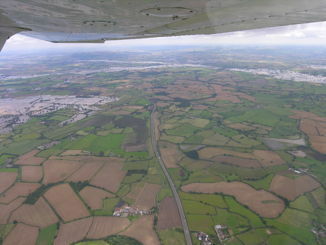 Looking out to starboard (northeast) above the M50 (coming in from lower left) at Pendock. 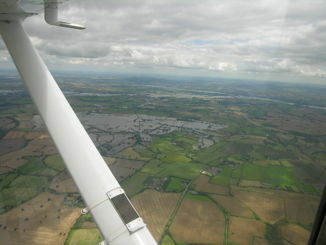 The flooded area forward of the wing strut is west of Longdon. Beyond that is the Severn and at the right is the Avon. Gloucestershire floods 2007. Looking out to starboard (northeast) towards the confluence of the Severn and Avon at Tewkesbury. Beyond the Avon at left of centre is Bredon Hill. Near the left side of the picture is the M50. The patch of trees near lower right is Berth Hill. 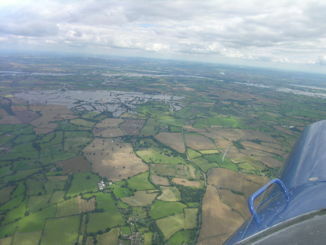 Gloucestershire floods 2007. Looking out to starboard (east) along the M50 towards the confluence of the Severn and Avon at Tewkesbury. Beyond the Avon at left of centre is Bredon Hill. 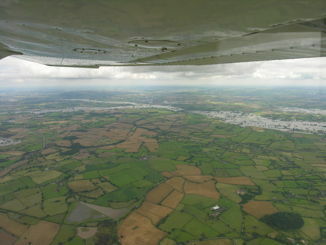 The flooded area at the left of the picture is Longdon Marsh, with Sledge Green in front of it. 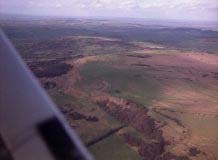 Just visible at the bottom of the picture, left of centre, is the edge of Berrow Wood. Gloucestershire floods 2007. Looking out to starboard (east) along the M50 towards the confluence of the Severn and Avon at Tewkesbury. Beyond the Avon at left of centre is Bredon Hill. 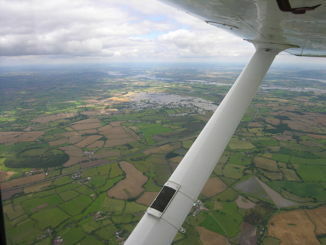 The flooded area at the left of the picture is Longdon Marsh, with Sledge Green in front of it. Gloucestershire floods 2007. Looking ahead (southeast) towards Cheltenham and Gloucester. River Severn running across the centre of the picture. Wainlode Hill just left of centre with the line of flooding area to its left, beyond the Severn, around the disused Coombe Hill canal. Gloucestershire floods 2007. Looking ahead (east) towards the confluence of the Severn and Avon at Tewkesbury. River Severn running across the centre of the picture. M50 running in from lower right towards centre left. 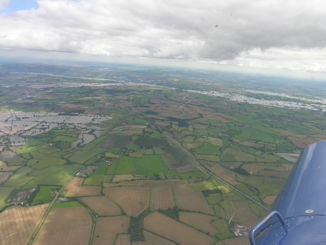 The flooded area at the left of the picture is Longdon Marsh, with Sledge Green in front of it. Beyond the Severn at the right is an area of flooding around the disused Coombe Hill canal. Gloucestershire floods 2007. 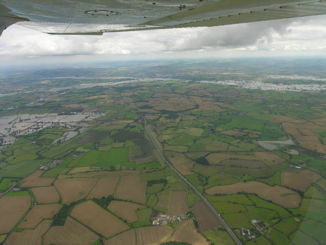 Looking ahead (south) towards Gloucester (centre left) and the Severn estuary (right) with the big bend of the river around Arlingham visible. Staunton is near right edge of picture. Gloucestershire floods 2007. Looking ahead (southeast) towards Cheltenham and Gloucester with the Severn running across the centre of the picture. The flooded area beyond the Severn left of centre is around the disused Coombe Hill Canal. A patch of trees to the right of that is Wainlode Hill. Tirley is slightly left of centre on the near side of the flooded Severn, with a line of trees beyond it through the flood marking the B4213 road across Haw Bridge. Corse Lawn is at lower left. 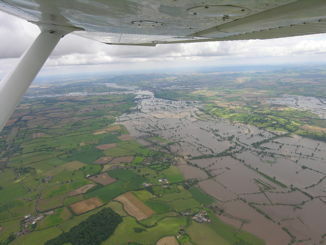 Gloucestershire floods 2007. Looking to port (south) over Staunton towards the Severn estuary (upper left) with the big bend around Arlingham, and May Hill (upper centre). 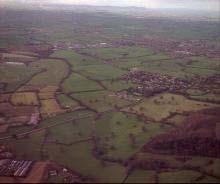 The glasshouses around Newent are below and to the right of May Hill. The flooded River Leadon flows left from near the centre towards the Severn. Looking to port (southwest) over the M50 near Junction 2 at Bromesberrow. No flooding in this area. The Severn estuary is just visible at upper left. 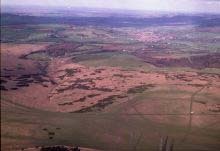 There are glasshouses at Bromesberrow Heath (centre) and Newent (left). The M50 runs in from the left towards the centre. Near the centre a strip of green through a brownish field is the Berrow airstrip. Left of that, beside a wooded area, is another much smaller and quite inconspicuous microlight airstrip. 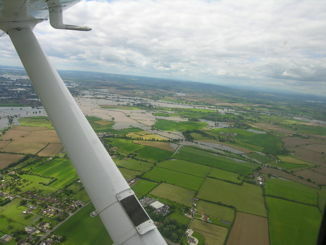 Gloucestershire floods 2007. Looking ahead (east) above Rye Street towards the confluence of the Severn and Avon at Tewkesbury. River Severn running across the picture. 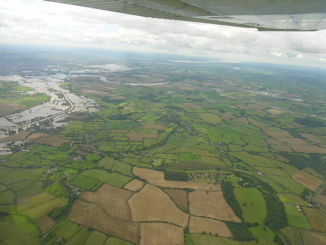 The flooded area at left centre of the picture is Longdon Marsh with Sledge Green to the right of it. Beyond the Severn at the far right is an area of flooding around the disused Coombe Hill canal. Gloucestershire floods 2007. Looking ahead (east) towards the confluence of the Severn and Avon at Tewkesbury. River Severn runs across the picture. Bredon Hill is left of centre beyond the Avon. The flooded area at left centre of the picture is Longdon Marsh, with Sledge Green to the right of it and Birtsmorton Court in the foreground. Gloucestershire floods 2007. Looking to port (east) towards the confluence of the Severn and Avon at Tewkesbury. River Severn runs across the picture. Bredon Hill is at the centre beyond the Avon. 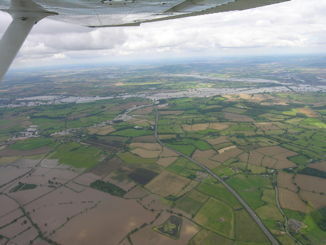 The flooded area at the centre of the picture is Longdon Marsh, with Sledge Green to the right of it. 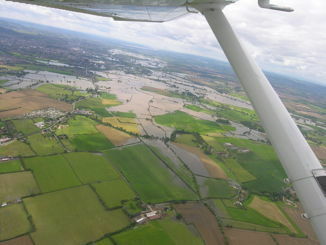 Gloucestershire floods 2007. Looking to starboard (northeast) along the M50. At upper right is the confluence of the Severn and Avon at Tewkesbury. River Severn runs across the picture. Bredon Hill is at the centre beyond the Avon. 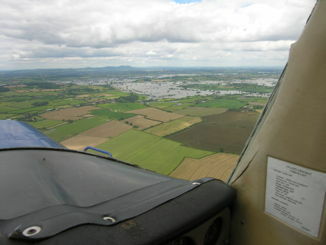 The flooded area at the bottom left of the picture is Longdon Marsh, with Longdon beyond it. Not actually Gloucestershire but nearby in Worcestershire so I'm not going to create a separate category just for this one picture. This is the distinctive appearance of the Confetti Flowers crop near Pershore. If you can add to the information here, please let me know. This page last updated 2013-03-30. I try to make this page as accessible as possible, by adhering to HTML 4 standards.